Climbing trees will always be one of my favorite things to do. Since I was a little girl I've been fascinated by climbing them and people that live in tree dwellings. When my dad lived in Florida I used to climb into the huge hearts of the trees and up the vines into what amounted to small rooms for my tiny feet. I would bring my dolls and set up houses on various levels. Unsurprisingly Swiss Family Robinson was a hit in our house. When we went to Disney World I would run through the Swiss Family replica tree house over and over leaving my dad on firm ground. I would wave triumphantly from every landing and window I reached, imagining (wishing? demanding?) that it could be my home. At my moms house in New York I climbed the Ginko tree to swing on the branches and hang upside down. After a summer performing circus tricks at camp I would do all the bird nest's and upside down splits high up in the canopy of yellowing leaves. For someone terrified of heights this whole obsession with tree climbing was pretty out of the blue. To this day I can barely stand on a chair without my heart rate jumping, but trees feel safer than anything man-made. 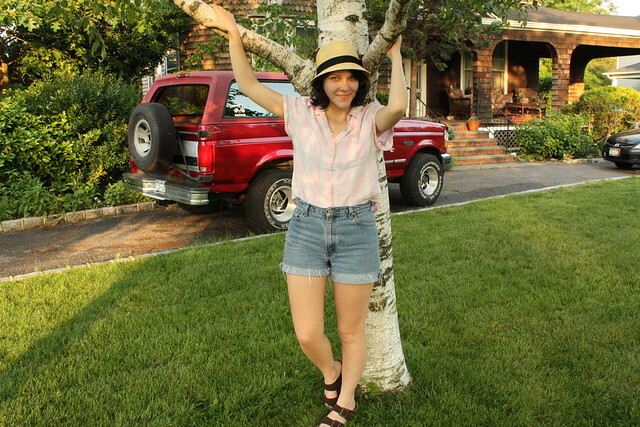 This summer I plan to spend lots of time swinging from branches and hanging out up a tree. I always wanted to climb trees as a child, but all the trees in my yard are like oaks and elms. . . much too tall to climb!! 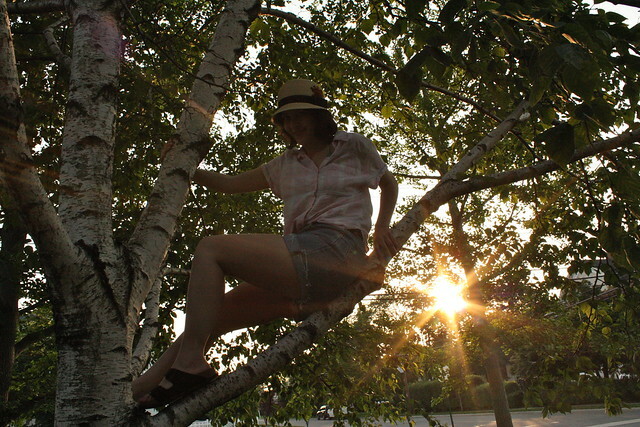 These pictures remind of summers when I used to live in Mexico-- now that I live here, in the US, it's hard to find a tree you can climb without looking like a freak, or, more importantly, a nice neighbor with tall trees that will let you climb them. I love this. I used to climb trees when I was little as well. When we moved to Georgia I left my favorite climbing tree behind and never did it again. Kind of sad now that I think of it. Hell yeah! I love climbing trees. I spent much of my childhood in our Choke Cherry tree. And I remember that part of Swiss Family Robinson... and also that I wanted to make my own alcohol, as they did. Who know why; I was about 12 and didn't even drink or like the taste, it just sounded cool! Oh, I always loved to climb trees but I was always so bad at it! I would get up a few branches alright but then I'd be too afraid to get down! Your turned up shorts are so gorgeous! Trees and tree-houses are amazingly fun. It's a good way to connect to nature. Climb on! Climbing trees was so the highlight of my childhood - it was always such a carefree and fun activity! i had an obsession with that movie as a kid as well. i love the part where the dad surprises the mom with the way he's done up the bedroom with curtains and everything-- too bad there was only one girl for the two boys or else they could have lived happily ever after (except for those pirates)! Swiss Family Robinson was/is my FAVORITE. I actually just bought the movie on DVD not to long ago, and I still love it, haha. And actually, I was just in Disney and insisted we go into the tree house there as well! I so badly wanted that house!